So, here's the question for this meme: Which menu would you serve to blogging friends for a welcome dinner upon their first visit to your home? Jennifer at Pie is the New Toast tagged me for this meme and it's a toughie for a newbie cook like me. But, I am willing to take on the challenge! Since it's me creating the menu, you will not be surprised that the dishes are all from Rachael Ray. I was going to really think outside the box and go wild, but then I decided that I would provide what I consider to be my go-to entertaining recipes. These really are the dishes I usually make the first time someone visits. Appetizer - When I went to the Sacramento Food Blogger's Potluck, I had to bring a dish for a whole bunch of foodies and they loved Rachael Ray's Pesto Torta. So, I won't second guess myself - that's the first course. Salad - Sweet and Bitter Greens Salad with Gorgonzola Blue Cheese Dressing. I make this choice based on the fact that food bloggers are generally the kind of folks who eat gorgonzola. I might be a bit hesitant with a different crowd, since it is, shall we say, a pungent cheese. Side dish - Well, Rachael added some Pesto Mashed Potatoes to the menu, but we don't do mashed potatoes in my house (part of our own Phase 4 of the South Beach Diet, as we like to say). 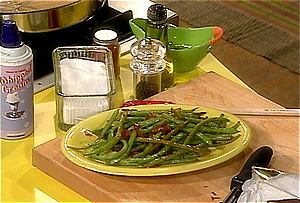 So, I would offer these simple but yummy Southern Green Beans. This is a dish I never would have tried pre-Rachael Ray recipe cooking. I made it last Thanksgiving and there were no leftovers. Plus, the rest of the meal is pretty healthy, so the bacon will be a treat. Dessert - Like Rachael, I don't bake. So, I would offer her Mexican "Fried" Ice Cream as a dessert. It's easy and definitely a crowd pleaser. Yummo!! Hey, us newbie cooks gotta stick together, huh?? It sounds wonderful, seriously I need to try that Garlic Roast Chicken w/ Rosemary and Lemon recipe. Yummmm. Susan - you are welcome. I have too many RR favorites to list (hence the blog! ).